The livestock sector provides us with meat, dairy and eggs, as well as wool and leather. The sector generates some €8.6 billion per year in the Netherlands. The government and the industry aim to optimise animal welfare and sustainability in the sector by 2023. The government is pushing for stricter EU legislation for long-term animal transport. Intensive livestock farms are growing. Their sizes differ, from thousands of pigs to tens of thousands of chickens. Increasing automation enables economies of scale. Many farms have automated feeding systems and climate control. Computer systems that recognise individual animals enable farmers to care for their animals more efficiently. There is a growing trend among farmers to support welfare-friendly and sustainable production in livestock farming, with milk produced by cows that graze in fields, free-range meat and eggs, and organic produce. Animals are provided with more space, outdoor runs with shelter and daylight in their housing. These measures go beyond legal standards for animal welfare. Animal welfare is key to organic livestock farming. Organically kept cows spend at least 120 days a year outside. Only sick animals are given antibiotics and animals are fed organic feed where possible. Organic farmers use organic manure and no artificial fertilisers or pesticides on their land. In recent years the government has taken measures to improve animal welfare in livestock farming. 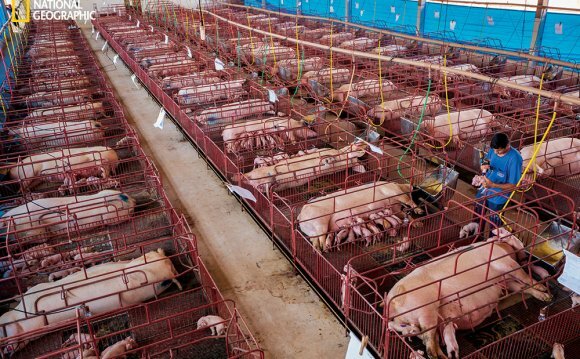 Examples include the European decision to ban battery cages from 2012, the European obligation for group pig housing per 2013, and the Government’s plans to restrict long-distance animal transport within the EU where possible. The government and farmers aim to optimise the sustainability of livestock farming by 2023, and can count on great support from society. Livestock farming should produce with respect for man, animal and the environment, all over the world. This ambition from the future vision on livestock farming is supported by a collaboration of farmers, the processing industry, supermarkets and the environmental movement. Livestock maintenance on the farm.